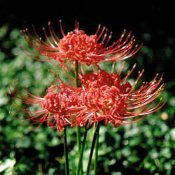 Lycoris Radiata, also known as Red Spider Lily and Hurricane Lily. Bright red spidery blooms atop tall leafless stems in late summer and early fall. Grassy foliage appears after blooms fade and remains green all winter, turning yellow and disappearing in early summer when the plant again goes dormant to get ready for its surprise bloom in late summer. Set of 3 bulbs. Price includes Priority Mail delivery. Available May-July only, since these tubers should not be disturbed any other time. They must be transplanted only when dormant. Just as with Daffodils, some pre-planning is necessary, and when you see them blooming in someone's garden is not the time for purchasing and planting Lycoris.